The Snow Child by Eowyn Ivey tells the story of Mabel and Jack, a couple who live on the edge of the Alaskan wilderness. The spark has gone out of their marriage and their lives. Mabel keeps indoors in their small cabin, mending and cooking and finding little joy in life. She was the one who convinced her husband to move to this wilderness as she wants to be away from people and the memory of the child she lost at birth. One winter’s evening she goes out on the frozen river, hoping for the ice to crack and her misery to be over. But it holds and so her sorrow continues. Jack is breaking his body trying to clear their land to plant crops. It is work for a young man and if he doesn’t succeed it will ruin them. He works on, knowing his wife is unhappy but he barely has enough energy to stay awake through the evening meal. All this takes place in the freezing cold Alaskan wilderness in the 1920s, home to bears, foxes, wolves and other wild creatures. One night it snows. Taken in by the sight, Mabel goes out into the yard and seeing her husband throws a snow ball at him. They find a moment of light in their otherwise bleak lives. And carried away with the emotion, Mabel asks her husband to help her make a snowman. They create the figure of a girl out of snow. The next morning the figure is gone – footprints leading away from where it stood, the red scarf and mittens that adorned it are gone. Over time, Mabel and Jack keep catching glimpses of a blonde haired little girl with a fox by her side. Are they getting “cabin fever” or is there a real child out there? Or is she something out of a fairytale – like the story of The Snow Child that Mabel read when she was young? I will leave it there as I don’t want to spoil the plot. This book was simply magical. The writing is so evocative that reading about the Alaskan cold had me reaching for a blanket to snuggle up under. 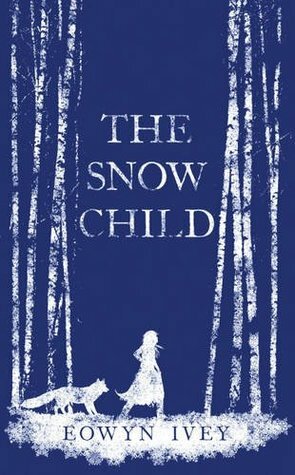 It kept me guessing as to whether ‘the Snow Child’, Faina, is a real girl or a magical creature created out of the couple’s longing for a child. Which authors’ writing styles do you admire? There are many authors’s writing styles I admire. The one that stands out right now though is Jane Austen because even though her novels often have heart-breaking events her writing style is light, detailed, and witty. I also love how observant she is! Ah yes, Jane Austen is a favourite of mine as well.